The University of Miami’s bullpen continues to have issues. 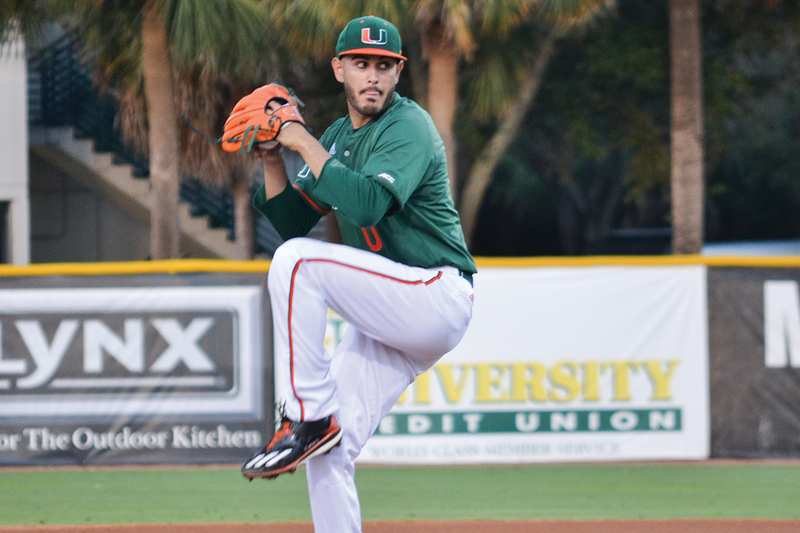 After leading 2-0 going into the sixth inning, the Hurricanes relievers struggled to close the deal, leading to a 3-2 loss to the FIU Panthers on Wednesday night. In the second game of a home-and-home series, Miami was unable to take advantage of yet another superb performance by its starting pitcher. The score was tied at two apiece going into the bottom of the ninth inning. Runners were on first and second base with one out, when FIU infielder Nick Day flied out to centerfield to score pinch runner Kolby Follis and end the match at FIU Baseball Stadium. A leadoff single and a bunt on Hurricanes closer Frankie Bartow put the Panthers in position to strike. Freshman pitcher Evan McKendry was starting on the mound for the first time in his career – he made an impression. McKendry threw six strikeouts and surrendered no runs in five innings of work. The Hurricanes were up 2-0 in the top of the sixth inning, and they were rolling. But as soon as McKendry went out, so did UM’s momentum. The Miami relievers had a difficult time. Freshman Albert Maury Jr. allowed a leadoff walk and a sacrifice bunt in the top of the seventh. FIU would score off a passed ball charged to senior catcher Joe Gomez to make the score 2-1. FIU (7-6) has now won five in a row. UM (4-8) has lost three straight. The Canes’ loss comes after a 12-1 beat down suffered to the Panthers on Tuesday. In that contest, nine of the 12 earned-runs were let through by the relievers. Miami is set to play No. 23 Georgia Tech in a three-game series this weekend starting at 7 p.m. Friday at Mark Light Field.